So admittedly, I'm not a "touristy" type of person who likes to go where the crowds go and flock to the latest restaurant opening as I'm not a big fan of lines or crowds. But when the First Lady told me that Primanti Bros was open and they also had pizza, I felt an obligation to get there and let the NEPA Nation know how the pizza is, even though you're probably going there to try a sandwich, and probably not the pizza. I also felt obligated to get out of my review funk and bring you some new content! 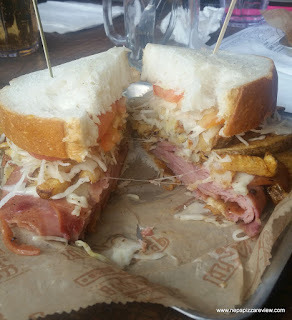 For the record, I've tried a Primanti sandwich once before out in Pittsburgh nearly a decade ago and I thought it was pretty decent, but the fries on the sandwich were more of a novelty to me at that time, but I figured it has been a while, so let's try again! We showed up just before the lunch rush, so there was no wait to get a table although the place was busy. As I looked around, I thought the place was pretty cool with the memorabilia covering the walls, huge flat screen TV's everywhere, and a really awesome square bar with a fire pit in the middle. We took a look at the menu to find that there was much more to this place than just sandwiches with fries and slaw on them. There were pizza, burgers, appetizers, and more. I also felt that the prices were very fair, I wouldn't call them cheap, but certainly fair for the portion sizes I saw on every one's plates. 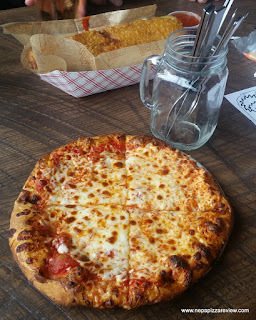 Of course, I was shooting for a pizza, but with also ordering a sandwich, I just ordered the personal 9" cheese pizza for $6.99, which was a tad overpriced in my opinion. The 14" at $11.99 was a little better value, and the 18" was $13.99, which is about what a premium quality pizzeria in NEPA would charge for that size - in other words, slightly overpriced. If you couldn't tell, I had an extraordinarily long time to review the menu - about 40 minutes until we went and requested service. 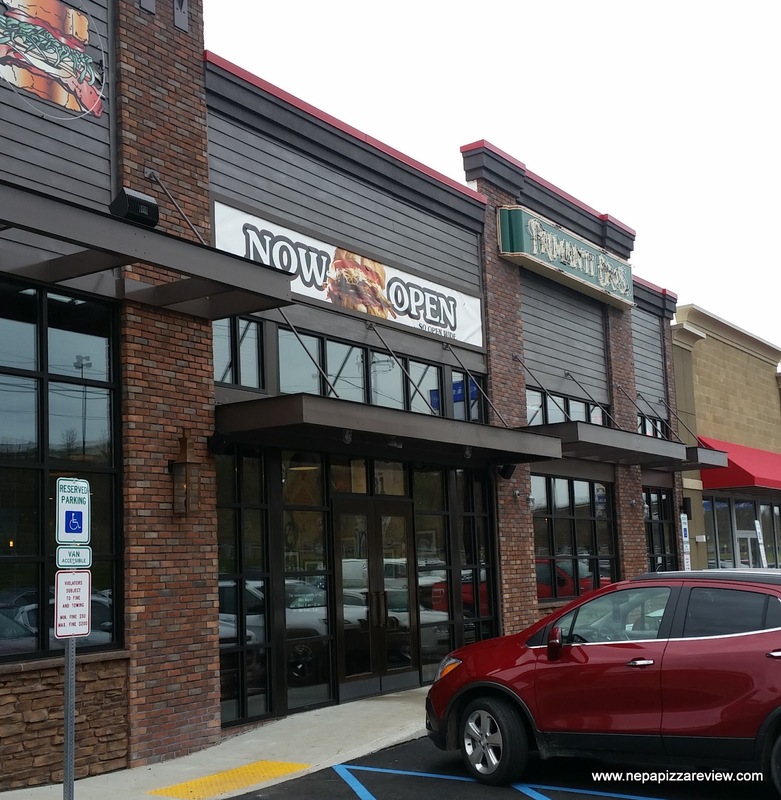 But, the place is new, the servers weren't fully trained or experienced and everyone is learning, so I guess it was an honest mistake, and the manager made it up to us by offering an appetizer or two on the house. Once we got our order in, the rest of the service was good. 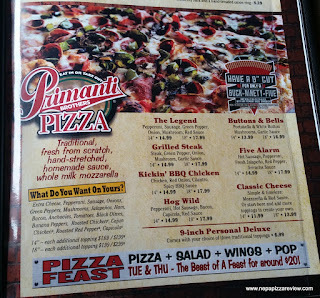 As I waited for my pizza to arrive, I noticed a sign that advertised "Primanti Pizza Feast" on Tuesdays and Thursdays. 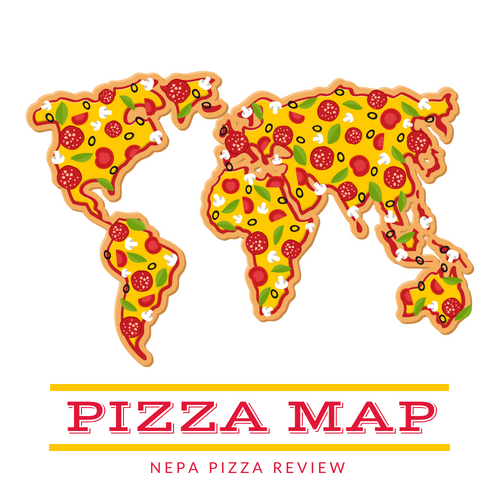 At first, my thought was "awesome, a pizza buffet!" but upon reading the poster further, it was just a package of pizza, salad, and as they call it in Pittsburgh, "pop." So my excitement quickly faded there. The pizza arrived, and my first impression was that the pie looked pretty standard. 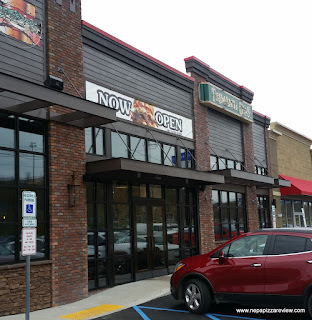 I was impressed that it was made of some sort of dough rather than a frozen shell and that the sauce had some substance and chunks to it - which are not characteristics of many chain restaurants which also carry pizzas (even though Primanti is not a huge national chain). 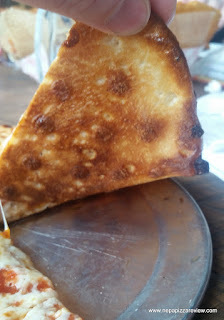 I grabbed my first slice and took a look under the hood to find the pizza was cooked on a steel screen so it wasn't super crispy, but it was sturdy and had a slight crunch. The dough was slightly tough, and a little brittle, but still reasonably tasty. As I said, the sauce did have some substance and chunkiness to it and even included some onions for flavor. I did actually enjoy the sauce as it wasn't bitter, had some slight sweetness, and was pretty satisfying. The cheese was just your standard cheddar (or similar) and had some light spottiness from charring which I thought added to the flavor. 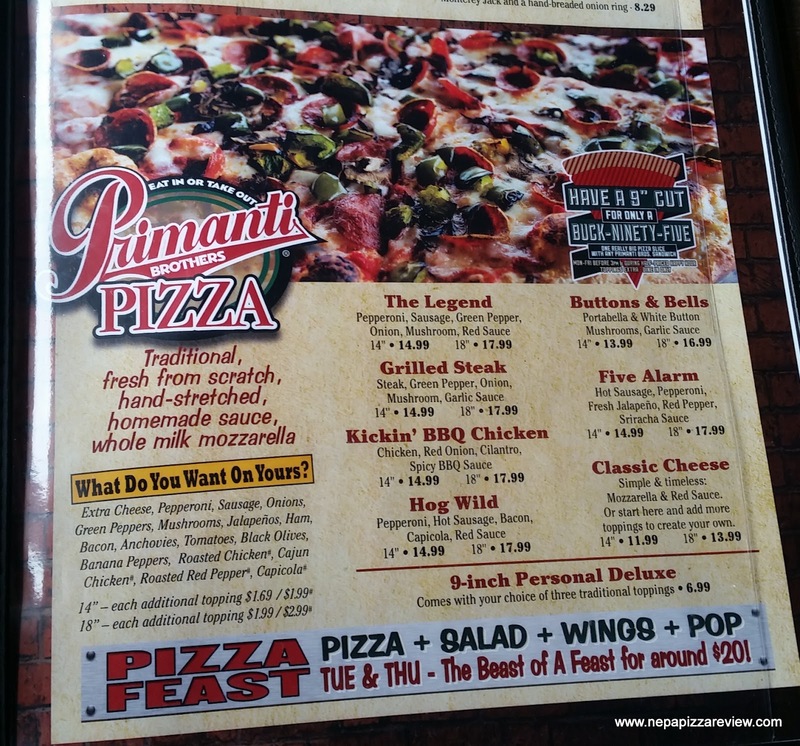 Really, it was a decent pizza overall, but at $6.99, there are better values on the menu with more flavor and fun. 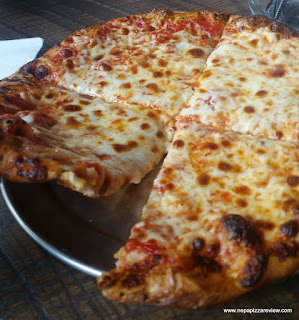 The best comparisons we came up with were "a thin Pizza by Pappas" "kind of reminds me of Pizza Hut" and "a lot like Chuck E Cheese" for those of you looking for comparables! I'm not a sandwich critic, but for the record I also had a cappicola and cheese sandwich to be a good sport. A few quick thoughts: The slaw was light and tasty, but I expected the flavor to punch through more than it did. I loved the thick-sliced cappicola. The thick sliced bread was light on top and soggy on the bottom, and I wish I asked for it to be toasted prior to eating. And for me, I thought the french fries detracted from the texture and flavors of the sandwich overall. The next time I go, I will order the fries and slaw on the side to better suit my taste. I probably won't go until the initial surge of business settles down and the staff is a little more seasoned, but overall I'd call it one of the cooler restaurant buildings in the Dickson City to hang out in, and the garage doors that retract to make it an open air establishment in the summer looks like a really neat idea! I'll be interested to see how well Primanti succeeds in NEPA with so much competition in the immediate Dickson City area. Although, when I drive through Dickson City, I'm amazed that almost every chain restaurant is packed nearly every night of the week! So Primanti obviously did their homework before coming here, now they have to deliver a positive and consistent customer experience to ensure people keep coming back. I wish them luck!